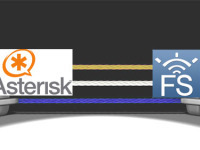 Asterisk and FreeSWITCH are both Back-to-back user agents, often abbreviated B2BUA. Asterisk and FreeSWITCH act as a user agent for multiple ends (two or more), and use a common protocols like Session Initiation Protocol (SIP). The system allows handling of all SIP signaling - route calls, transfer calls, and can even translate codecs between different.